Since December, 26 2008 the Minor Planet Center assigned the code B82 Maidbronn to my observatory place. All observations of comets and minor planets taken from my location are submitted to the MPC. 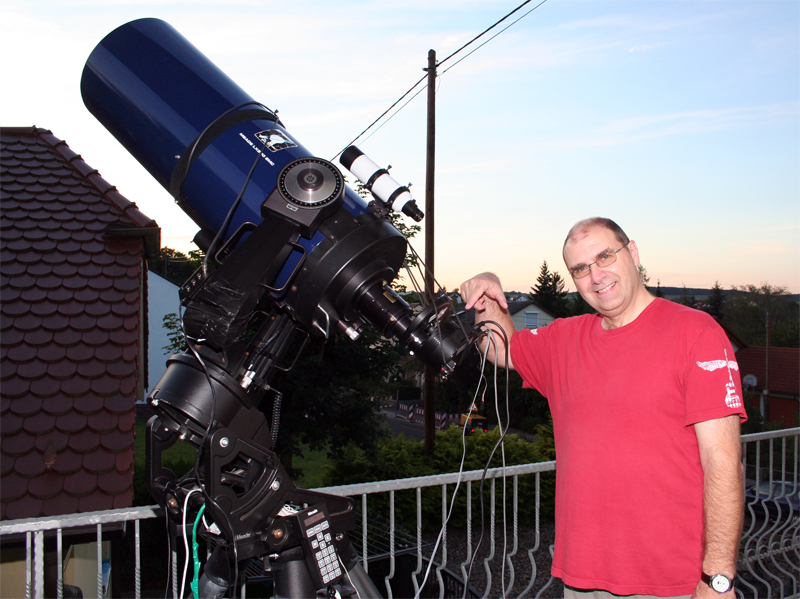 The astrometry and photometry for the MPC is performed by Astrometrica of Herbert Raab. The images are processed with Astrometrica, CCDSoft Version 5, MaxIM DL, AstroArt and Adobe Photoshop CS3. The videos and animations are created with Studio Version 9 or Adobe Fireworks CS3. 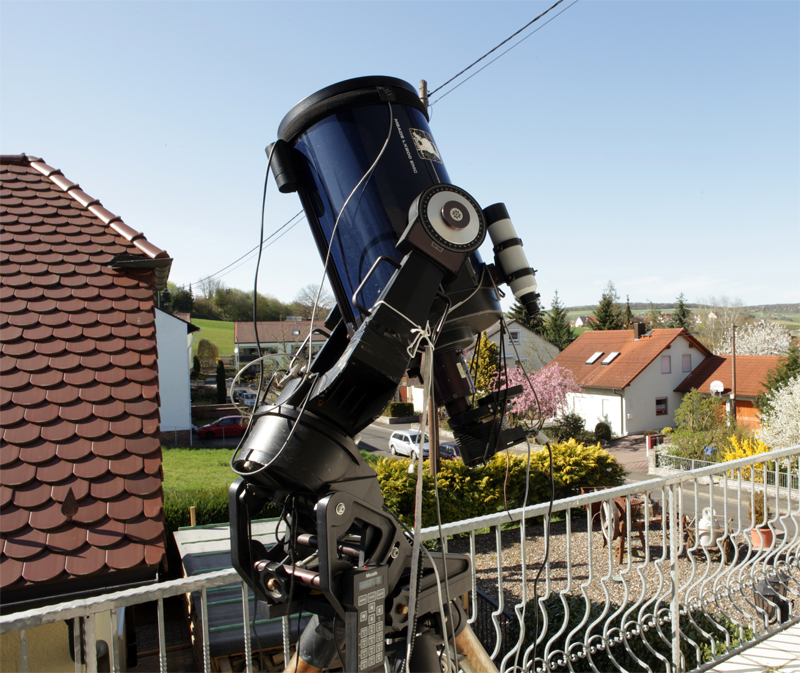 When I bought this telecope in 1992 here in Germany, I belonged to an exotic group of amateurs in contrary to the most observers at this time. 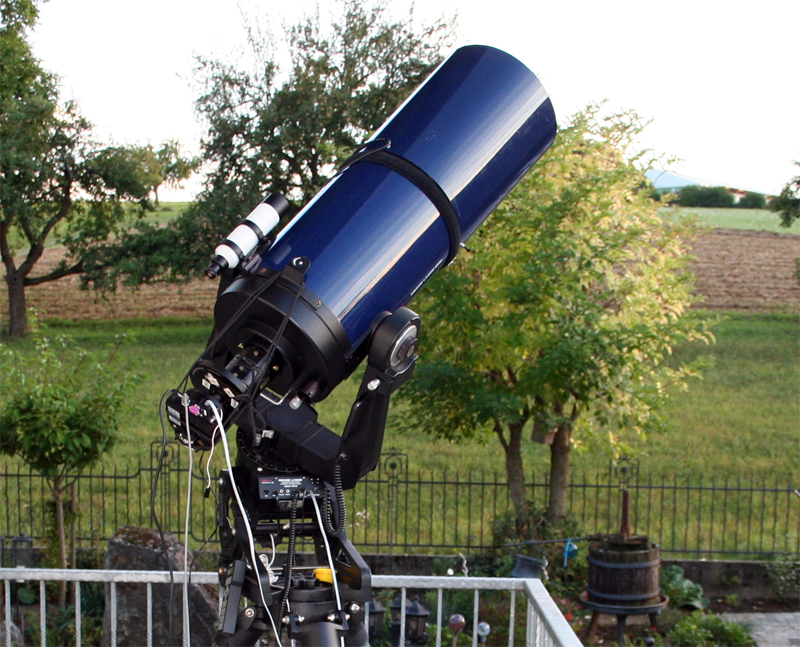 Computerized telescopes were still taboo for many amateurs in the nineties. Classical LX200 12" f-10, here reduced to f-5.6 with a Lumicon Giant Easy Guider. This telescope was running since 1992 without any basic maintenance. 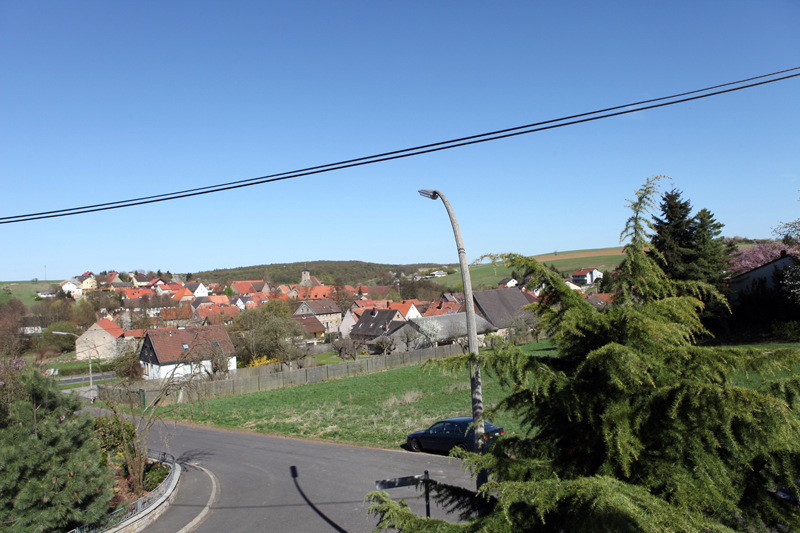 In 2004 it fell from the balcony you see on the image. A tremendous squall during a thunderstorm lifted up the telescope and threw it over the balustrade headfirst into a bush 3 meters down. The bush was absurbing the fall and brought the telescope back on its right position before it touched the ground. The wet grass ground catched the telescope with the tripod in position down and deformed parts of it. But the body of the scope was unhurt. a good price :), but I will never sell it, sorry. 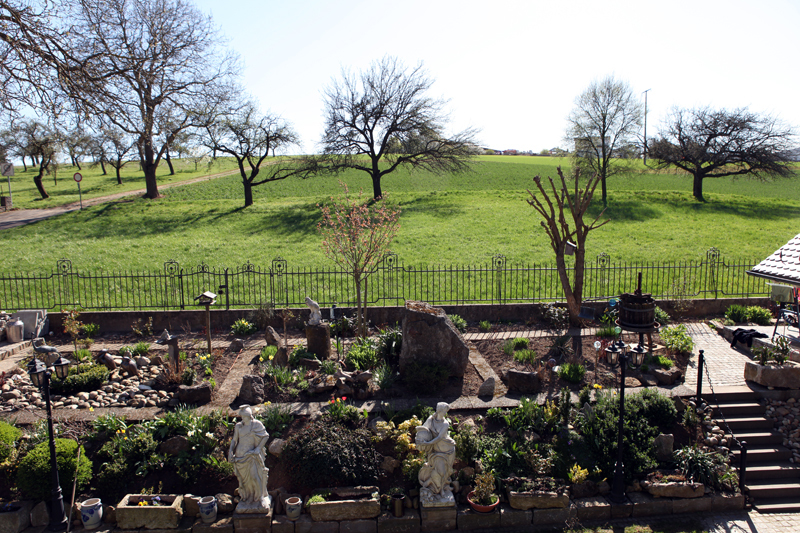 As you see, my view is very restricted by the balcony. But over the night, most of the comets are crossing my field of view. 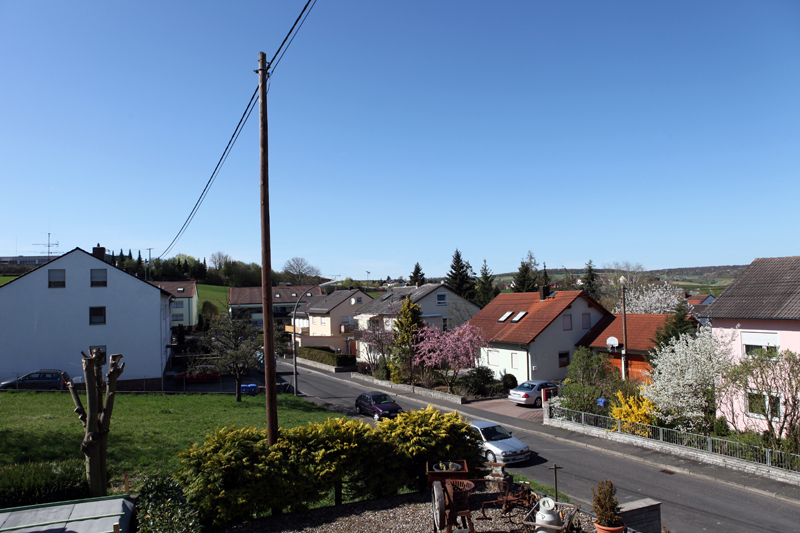 The 130.000 inhabitants city of Wuerzburg is situated 7 kilometers (4 miles) southwards. For naked-eye observation the light pollution is very disruptive. But the CCD camera is pretty excusing this problem, especially at dry, clear skies. This bundle of steal, glass and wires is controlled over four interfaces. Over the COM1 port (special interface cable USB to COM #38011 of W&T) the telescope is connected to the computer (now 64bit Windows 10) and controlled by TheSkyX Pro. The COM2 Port (second interface cable #38011) is controlling the RoboFocus. The COM7 Port is handling the True Technology Ltd. 2" Filter Wheel. A fourth cable is connecting the CCD camera via USB2. The imaging software is CCDSoFT of Software Bisque.